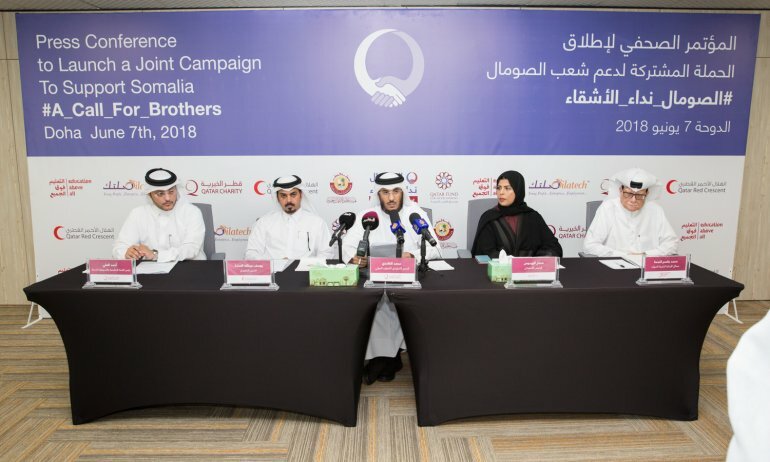 HA: Qatari charity organisations joined hands to raise over QR60m to support people fighting for survival in Somalia due to humanitarian crises caused by famine which has affected nearly half of the population of the country. A joint campaign to support Somalia will be launched in Qatar on Sunday by four Qatari humanitarian organisations including Qatar Red Crescent Society, Qatar Charity, Silatech and Education Above All Foundation under the supervision of Regulatory Authority for Charitable Activities and supported by Qatar Fund for Development. The campaign aims to raise more than QR60m to meet the humanitarian and development needs of the Somali people and provide water, health, education and economic empowerment services, as well as humanitarian intervention in flood-affected areas to provide shelter, food and medical supplies, QNA reported. The money will be spent on drilling and rehabilitation of wells and water systems, establishment of income generation projects, support to the agricultural sector, creating educational opportunities, building and renovation of schools and health centers, treatment of patients, distribution of food baskets, establishment of social centers, and road development. Somalia is suffering from acute crises, perhaps the most serious of which is the famine that threatens 6.2 million people, nearly half of the population, because of water shortages, according to statistics from international organizations and United Nations institutions. There are up to 2.5 million displaced persons, and more than 400,000 who need urgent medical assistance, these statistics indicated. Somalia has low enrollment rates in education, where the rate of enrollment in primary and secondary schools 30 percent and 26 percent respectively. Speaking at the press conference, representatives of the Qatari humanitarian organizations stressed that this campaign is a reflection of the spirit of solidarity between the Qatari and Somali peoples and the official and popular stance of the State of Qatar in support of Somalia in all circumstances and in response to the humanitarian situation in this brotherly country, as a result of recurrent drought and unstable situations due to conflicts. Qatar Charity’s Executive Director of International Development Department Mohamed Ali Al Ghamdi said that this joint campaign is a religious, humanitarian and moral duty for brotherly Somalia, asking people of Qatar to support the campaign to meet part of the humanitarian needs of the Somali people in the areas of water, health, education, food, shelter and other relief and development projects. He pointed to the deteriorating situation of various sectors of education and health services in Somalia and poor infrastructure and lack of food and medicine, as well as the problems of displacement as a result of disasters, floods and conflicts, adding that reports of international organizations reveal the difficulty of the humanitarian situation in this country, which is trying to recover. Executive Director of Qatar Red Crescent Society (QRCS) Youssef Abdullah Al Sada said that recent floods have displaced nearly 700,000 people to double the suffering of this Somali people, stressing that this humanitarian campaign aims to alleviate their suffering. He explained that the QRCS will work through this campaign in various areas of Somalia in the sectors of health care, food security, water, sanitation, education and emergency relief intervention. He said that QRCS, which has been operating in Somalia since 2000, had implemented a number of projects over the past years which were benefited by nearly 900,000 people directly, and about 4.5 million people indirectly. CEO of Silatech, Sabah Al Haidous said the humanitarian situation in Somalia requires the cooperation of humanitarian organisation, and the support of all sectors as well as the donations from the people of Qatar to alleviate the suffering of Somalis through this campaign, which seeks to extend relief assistance to those affected by drought, famine and poverty in Somali regions. She added that Silatech’s participation in the campaign is a continuation of its hard work in combating poverty and youth unemployment, which are one of the most urgent problems in Somalia. “We are trying to invest the energies of young people in the development of this country and to protect this enormous human wealth from falling prey to extremist groups,” she said. She said that Silatech, which has been operating in Somalia since 2012, had helped providing 33,400 jobs for young men and women in Somalia by facilitating the access of young entrepreneurs to finance and labor markets and training them to contribute to the development of promising sectors in that country. Mohammed Jassim Al Naama, from the department of resources development of the Education Above All Foundation, said that this campaign aims to support the local community in Somalia, which faces great challenges that affected greatly the indicators of sustainable economic development, services and others. “We seek to empower these groups to become active in this society, contribute to the process of development, and achieve stability,” he said. The representative of the department of resource development of the Education Above All Foundation said that the foundation will use its capacity and network of international relations and partnerships to serve the cause of education in Somalia, which records the lowest enrollment rate of children in primary education in the world, noting that UNICEF statistics indicate that 4.4 million Somali children are not enrolled in education. He noted that in 2014, the foundation and UNICEF started the “Formal Education for Out Of School Children in Somalia” project, providing primary education for approximately 64,000 children aged 6-4 years, building, qualifying and furnishing 800 classrooms, providing school supplies to 308 schools to enhance the quality of education as well as organizing training programs, capacity development and others. People of Qatar, individuals, institutions and companies have been urgede to support this campaign to help the affected people in Somalia and to stand by them to promote development and achieve security and stability. On 27th of Ramadan, Qatari humanitarian institutions will launch live radio and TV broadcasting seeking donations for the campaign along with their campaigns across different media channels and social networking platforms.